Music instructor and program director, Spencer Askin, caught up with OC Weekly to brag a bit about the kids he teaches at Los Rios Rock School in San Juan Capistrano. Rightfully so, since these up-and-coming teenage musicians are scheduled to perform the technically advanced and beloved Queen album, A Day At the Races, as a 30-piece rock orchestra this Saturday at the Coach House. Doors open at 5pm during dinner, with the concert starting at 7pm, which open to all ages. Tickets are $18 and available at the door and on the school’s website. OC Weekly (Kim Conlan): What goes on at Los Rios Rock School? Spencer Askin: Our owner and founder, Tyler Marolf, started in his house in the Los Rios School District in San Juan Capistrano. Since then, it’s grown to three buildings, 160+ students, and ten or eleven instructors. It’s a performance-based school, so the kids get to learn whatever instrument they want, or a bunch of different instruments with their instructors. 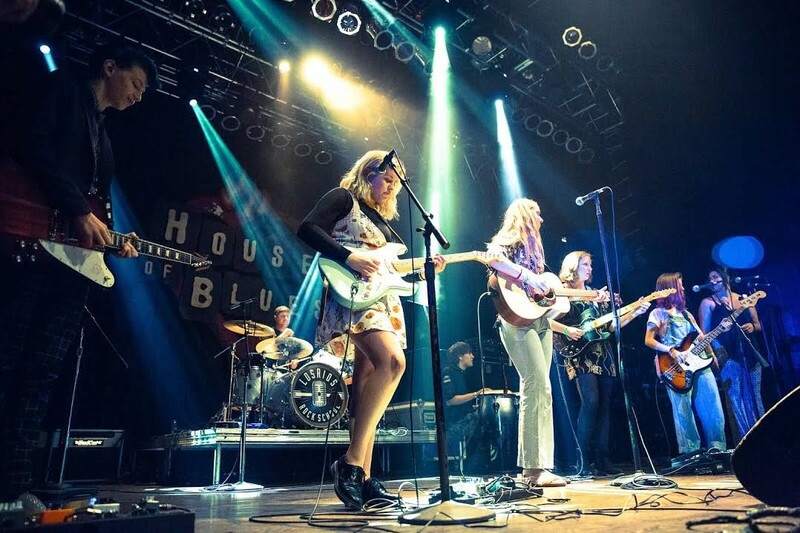 Then on the weekends, they’ll be put into groups—performance groups—where they’ll make a band and play big shows at places like Coach House, House of Blues, and Stillwater. One thing that separates us from most schools is that we allow our students to play on pro level gear, all of our rooms are outfitted with custom DW or Vessel drum kits, and Bad Cat hand wired tube amplifiers—made right here in Irvine. So the kids learn not only about playing their instruments, but also about how to use gear, and how to manipulate their own sound and tone in a real world setting. I am an instructor here, and I’m also the program director. As an instructor, I have 23 students right now, doing guitar, bass, singing, a lot of songwriting. It’s really fun getting to see them create and express themselves in that way and learn about the art of songwriting, and recording, and how to arrange stuff and make parts and all that. We have ten performance groups, including this Classic Albums group. What types of performances have the Classic Albums group done in the past? We’ve done two so far. The first was Led Zeppelin II, , a really guitar-heavy record, and a lot of like crazy lead vocal work. And then we did Abbey Road, which was headed by one of our instructors, Christian Hernandez. Then we thought, a lot of these kids are seniors in high school and they’re going to be going away to college next year, so we thought that we ought to get them a big challenge before they go. What’s the setup for the performance? We wanted to do everything as it’s heard on the record, so I went in and separated tracks, and wrote down every guitar part, so most of the songs have five guitars, and some have up to eight. We’ll have eight amps on stage, with everybody playing the parts—no harmonizer pedals or octave pedals or anything like that—it’s going to be eight people playing just like he did. Then for the vocals, he had a choir on every song, so we have a 21-person choir singing all of the backups. They’ll be on one side of the stage, and then guitars on the other—from that choir the lead vocalist will walk out to the front when they sing their song. Why is this important for this group of young kids? What I’ve seen with my students, the real important thing is inspiration—seeing the kids really get inspired by music, and find something that they love that they are drawn to that they feel like is a part of them that they can identify with. It’s not always just about the technical stuff. I’ve seen a lot of great friendships made, and kids making their bands outside of here, and starting to write songs, and record, and go out and play.